Have you ever experienced that sluggish feeling around 3 p.m. at the office when your eyelids and head become so heavy that you are tempted to curl up under the desk for a quick nap? The problem is that there are still several hours on the clock and you need to snap out of it if you ever expect to get out of there before dark. We have all experienced this feeling. Believe it or not, even the Japanese have. This would explain why supermarkets and convenience stores in Japan have stocked their shelves with a cornucopia of energy drinks that would compare to popular American energy drinks like Red Bull or Monster. Japanese energy drinks differ in a few subtle ways that, in my opinion, make them slightly healthier than their American rivals. Okinawa power!!! Power Gia is the Okinawa-made answer to those seeking to boost their afternoon energy. Energy drinks in Japan can be divided into three categories: pharmaceutical-drugs, quasi-drugs, and the carbonated beverages. The ‘pharmaceutical drug’ energy drinks cannot be bought without a prescription from your doctor. Only the prescription will allow you access a ‘tonic’ that will lift you out of that lethargic 3 p.m. feeling. The second category of energy drinks is the quasi-drugs category. Most of the medications inside these beverages have a milder effect than the pharmaceutical drug-based drinks and can be purchased without a prescription. They are usually sold without carbonation although recently many brands have begun to carbonate their products. Quasi-drug energy drinks usually come in a brown glass bottle. The brown color is used to prevent the breakdown of important amino acids and vitamins contained inside. This is an element that is lacking in the American energy drinks. Another sharp contrast is the amount of product that is suggested for consumption. On the Japanese labels, suggested consumption is usually limited to one per day for people aged 15 and older. This strikes a sharp contrast to carbonated energy drinks (such as Red Bull) sold in America, which usually come packaged in cans or clear plastic bottles and without suggested limitations on how much one should drink per day and per age. The immediate distinctions between pharmaceutical energy drinks and quasi-drug energy drinks are the price and the packaging. The pharmaceutical energy drinks are understandably pricier, and usually packaged in shiny excessive layers of packaging that are peeled back to reveal a single bottle of the ‘super drink’ contained within. The quasi-drug energy drinks are much more affordable and usually come packaged in boxes of 10 for the same price as one pharmaceutical grade beverage. These drinks have become a ‘must have’ in any Japanese lunchroom because of their ability to assist us in increasing alertness after endless hours of breathing lifeless stale office air. The final category of energy drinks is the carbonated beverages most readily accessible and most popular in Japan. 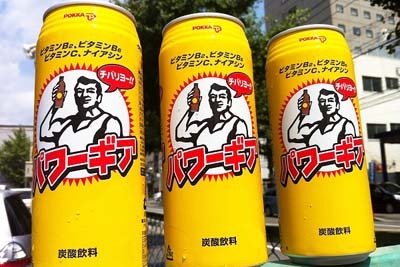 In Okinawa, the energy drink that jumps off the shelf is ‘Powa Gia’ which is translated to ‘Power Gear’ in English. The bottle is designed with an image of an ultra muscle man, dressed in a wife beater, that oozes ‘Full of Energy!’ to any browsing consumer. I always prefer to support local Okinawan products when I can, and when in need of an energy drink for a long car ride up to Nago, this is the most refreshing beverage in any vending machine on Okinawa. The most important and abundant active ingredient in an energy drink is obviously caffeine but Power Gear is also packed with sugar to boost flavor and provide the quick energy rush we are all seeking. There comes a time in all of our lives when it becomes clear that it is absolutely necessary to slam back an energy drink. Without a second thought of the detrimental health effects it will have on the future children you hope to bear, relish the blast of energy surge for a bliss that can push you up and over that 3 p.m. slump and towards another workday’s end.